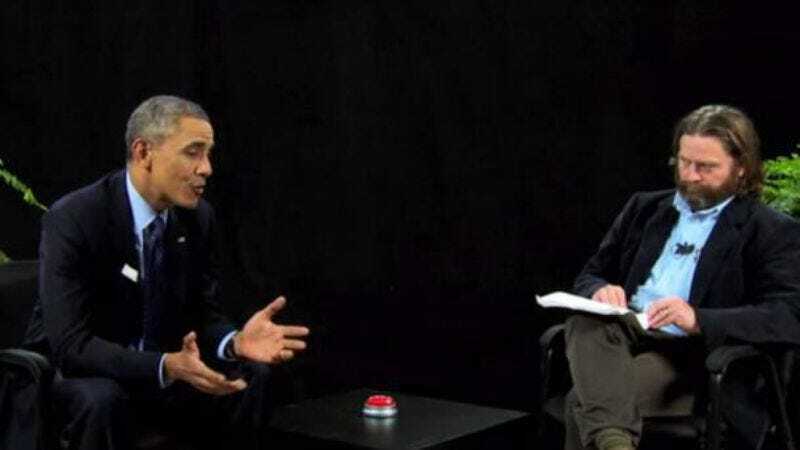 Funny Or Die’s web series Between Two Ferns made a big splash earlier in the week when the show landed perhaps the biggest guest possible—President Barack Obama, who traded barbs with host Zach Galifianakis about pardoning turkeys and The Hangover Part III. In an interview with Vulture, Ferns producer Scott Aukerman (also the host of Comedy Bang! Bang!) talks in detail about getting the show into the White House, bracing for censorship that never came, and giving direction to the most powerful man in the world. Aukerman had been in touch with the White House about producing a video to promote the Affordable Care Act (known to your relatives who post things on Facebook you don’t agree with as Obamacare, ObamaScare, O’Bummercare, or that thing that will definitely completely destroy America in very vague, unspecified ways). After several years of back and forth, Aukerman suggested a Ferns appearance, and to his surprise, he got a thumbs-up from the Oval Office. As a spoof talk show, Ferns’ format is built around guests with something to plug, so the show didn’t have to change anything to accommodate the President; he was simply plugging a landmark piece of healthcare reform instead of a romantic comedy. Although a romantic comedy in which Emma Stone is a struggling baker who curates an art gallery on the side, but can’t get health insurance from either job, wouldn’t be the worst romantic comedy she’s been in. It would also star Channing Tatum is the heavily spray-tanned Speaker of the House who has to put aside his political leanings to win her heart. This Christmas, love…is a pre-existing condition.